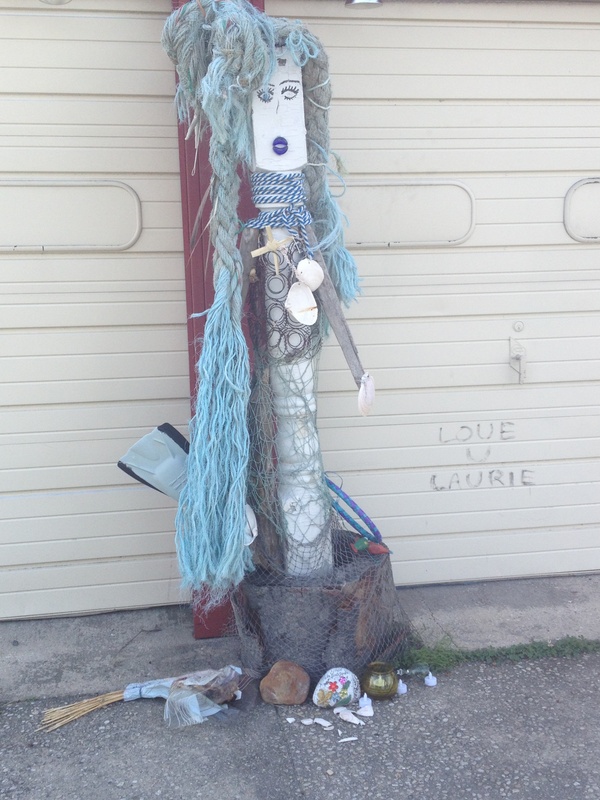 Laurie ran a local farmstand that sold tomatoes, corn, peaches, the usual summer fare, along with odd items like jumbo homemade Hula hoops covered with electrical tape, and dreamcatchers made from jute and antique jewelry findings. She sold local honey at exorbitant prices, and by the cash register there was a take-a-book, give-a-book exchange-shelf filled with tattered thrillers from 10 years ago. 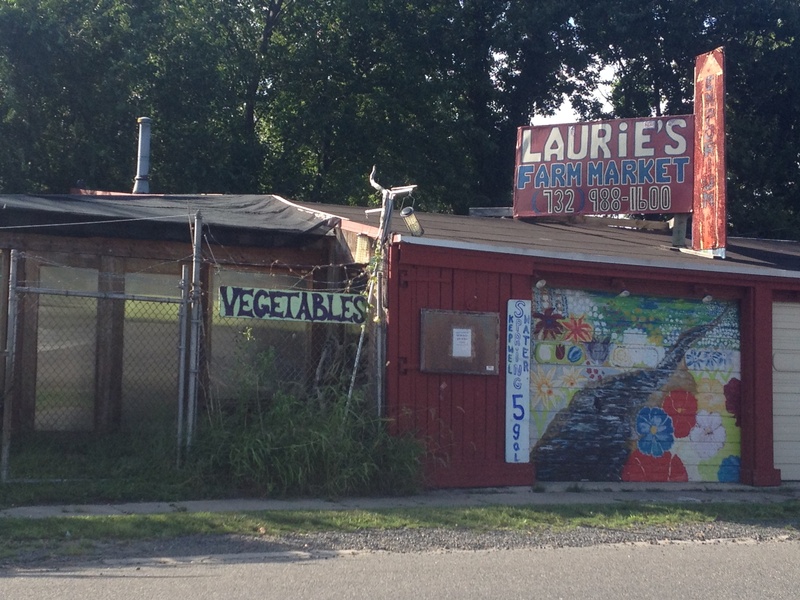 Often when I rode my bike, I would pass by Laurie’s to buy an overpriced peach or two and chat about the weather, or the tourists, or what it’s like in the winter at the Shore. Her black Lab mutt, corralled in the back, would whoof loudly when I approached the counter. As if that explained his ill temper. Burnt-out battery-operated candles and a broken wine goblet completed the sad sidewalk tableau. A girl in her twenties passed by walking a dog. I asked her what had happened. Now I was feeling uncomfortable, and very mortal. She had been six years younger than me. And dying from an asthma attack must be horrible – basically, you struggle for breath, unsuccessfully, until you suffocate. The neighbor didn’t know if the business would reopen. She’d mentioned once she was divorced, but I had no idea she had grown children. And I’d thought the woman who made the hoops and dreamcatchers was her business partner or life partner or whatever, but nope – just someone Laurie had allowed to share the selling space, so she wasn’t taking over either. She was a friend, but I hardly knew her. Like my older brother, she espoused a homespun hippie philosophy of live and let live, and doing the right thing for the world. With her jeans and work shirts and unruly blond hair, she could have been a pot-smoking Dead Head, but she wasn’t. She worked hard. She got up early to go to the local farms to pick out whatever they had that looked good that day. Often she harvested it herself, and she had the dirty fingernails and scraped and calloused hands to prove it. But she wasn’t complaining. She seemed to love her work. Two years ago she had boxes of exotic melons, perfectly round and bright yellowish green, like lime-saffron bowling balls. The fruit was remarkably sweet and juicy, with a subtle floral flavor that snuck up on you after the last bite. I tasted a sample Laurie had set out at the stand, and bought two on the spot. We cut one up that night and it was every bit as perfect as the sample. But we waited two days before cutting into the other one, and by then it was slushy, almost rotten inside, and we had to discard it. Apparently, they had a short shelf life. Wonderful piece! So so true. Thank you for bringing this to the forefront. Ya never know. Live today like it’s your last.